ETERNAL STEPS WATER FOUNTAIN by Cascading Fountains home decor, jewelry, decor, decorations, electronics, fountains, floor mats, art glass, vases, garden essentials, fireplace screens. Fire and water combine to form one spectacular decoration! 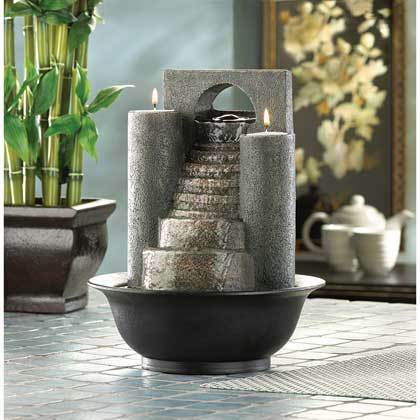 Cascades of water trickle down faux-stone steps, while tealights glimmer from atop twin pillars. A tabletop fountain to treasure! Material(s): POLYRESIN. Weight 2.8 pounds. Dimensions 8.62" x 8.62" x 11".